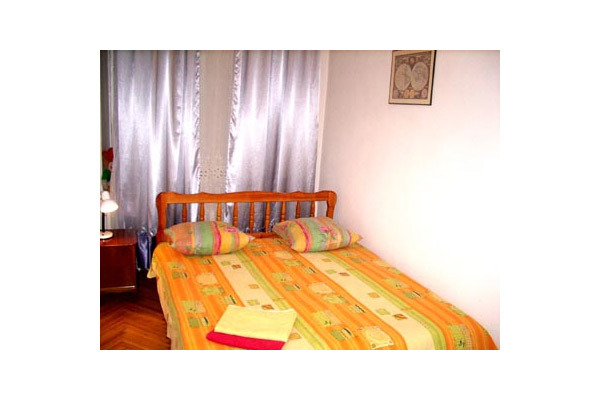 This apartment is situated in the very center of Kiev across the road from National Opera Theatre and Golden Gates Metro station. Living-room windows overlook theatre complex, especially wonderful with night lights on. 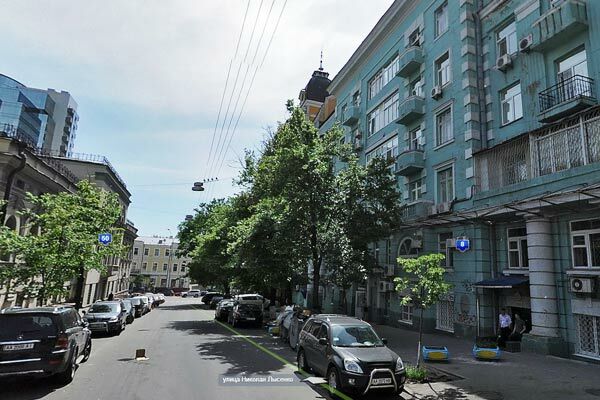 The building is renown in Kiev due to its predominantly opera singers and dancers inhabitancy. Also Theatralna Metro is nearby. Central street of Kiev Kreshchatyk lays in 5 minutes walking. There are three major central parks of Kiev adjascent to this area - University botanic garden, Shevchenko park and Volodymyrska hill. 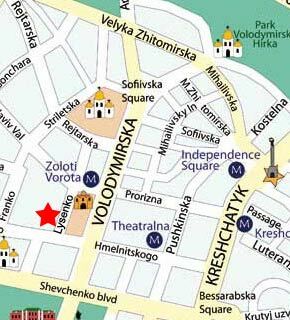 Also this place is considered to be elite business and entertainment area of Kiev, surrounded by offices, restaurants, pubs and night clubs. The first floor of building houses grocery and vine boutiques. 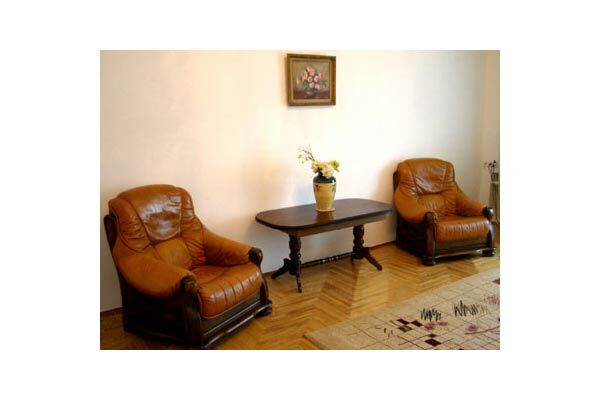 One of advantages of Lysenko apartment is secure guarded courtyard with car parking place. 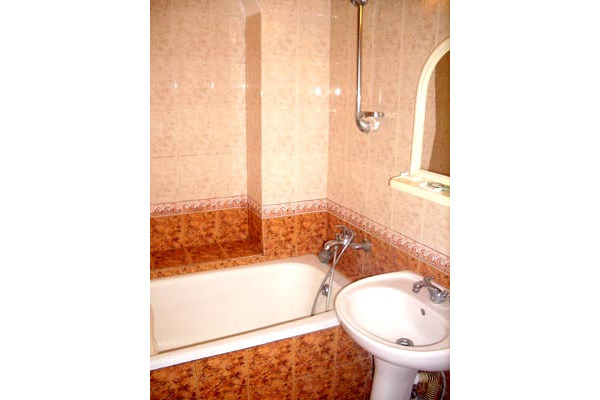 One bedroom roomy VIP flat on the corner of Kreshchatyk. This fairly simple but neat and tranquil apartment combines warm homely atmosphere, comfort with relatively low rental fee. Disposition of your temporary home in Kiev could not be better. Everything necessary is at hand: groceries, restaurants and shopping malls. Located on the sixth floor of historical building with elevator, it has two separate bedrooms: master bedroom (26 square meters) and guest bedroom (15 square meters), spacious living-room with leather transforming couch. Tall ceilings outline the roominess of apartment while balcony provides unforgettable view to the roofs of old Kiev blocks near National Opera Theatre. There is everything indispensable for short term accommodation or prolonged stays on this apartment - air conditioning, washing machine, dish washer, independent warm water and heating. Oak wood floors and heavy almost antiquarian carpentry were carefully restored, imparting the apartment additional charm and elegance. We recap this apartment is very popular not only for moderate price but also due to its quality, amenities and desirable location in the very heart of Kiev. 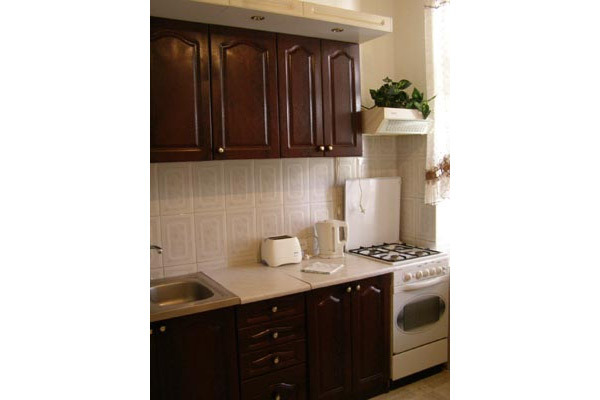 All kitchen appliances, fridge, gas stove and microwave oven.